Simms Pro, Ish Monroe May Be the Last Man In the 2017 Bassmaster Classic But he Likes His Odds. It’s been a roller-coaster couple of weeks for Elite Series pro Ish Monroe. Just six days after finishing the 2016 season in 40th place in Angler of the Year standings – exactly one point out of qualifying to fish the 2017 Bassmaster Classic in March – Monroe learned that he had actually qualified for the Classic when the winner of the Northern Open on Lake Oneida failed to meet all criteria to claim that event’s automatic Classic berth — Monroe is officially the “last man in”. We connected with the four-time B.A.S.S. winner shortly after he got the Classic invite, and questioned him about his off-season preparation, his 2016 season as a whole and how he feels about his chances next March 24-26 when the Classic arrives on Lake Conroe in Texas. SIMMS: Well, you had to wait an extra week to find out, but you’ve made your 10th Bassmaster Classic. Congratulations. That had to have been an interesting week in between the AOY Championship and the Oneida Open. MONROE: Oh, you have no idea. I was not a happy guy to be around that week, but I’m glad to be in. The Classic is still the biggest event in our sport, and you can’t win it if you’re not in it. Plus, this is one Classic where I feel like there’s really no advantage for anybody fishing it. Lake Conroe in March will be a totally different deal than it’s been when we’ve fished it for the Toyota Texas Bass Classic (2009 to 2013). It’ll be won by the guy who figures the fish out the best that week, not somebody who gets on a super-secret offshore spot. SIMMS: Expand on that a little. How do you expect Conroe to fish? MONROE: It’s going to be a shallow, bank-beating tournament. It won’t be the offshore deal that people have seen in late summer with the TTBC, where you’d get a little bit of topwater in the morning and then an offshore bite the rest of the day. It’s not a big lake, but it has a bunch of docks and wood. There’ll be fish on beds in that late-March time frame, and I feel like sight-fishing will be a factor. I like my chances in that scenario, because I feel like I’m one of the best sight-fishermen in the game. SIMMS: What do you expect will be your go-to bait then? MONROE: I expect to catch them on a swimbait, a wake bait, a frog, a big tube — just big baits in general. That lake has a lot of big fish in it and it takes a big weight to win, but I feel like I’m pretty good at those techniques. SIMMS: Let’s run through your experience at the AOY Championship at Mille Lacs in Minnesota. You weighed in 17 pounds, 11 ounces on Day 1, 17-8 on Day 2 – it seemed like you had a pretty good handle on finishing high enough in that tournament to guarantee you’d make the Classic. But then on the final day, you came in with 13-8, which dropped you nine places down to 43rd and out of the Classic. MONROE: I had one bad day. No, check that, it wasn’t just one day for the season, I had some others, but none of those days killed me like that final Sunday did at the AOY. It was a bad day mixed with local pressure on a lake that really never gets any when we’re not there. There were just so many bad things that happened that day, it was unbelievably frustrating. SIMMS: How about the rest of your season, though? Can you point to some instances during the regular season that contributed to you being in that kind of “do or die” situation at the AOY Championship? MONROE: Oh yeah, of course. I cashed checks the first five events of the season, but at each one of those tournaments, I can remember a fish that I didn’t land. I also look at Wheeler Lake where I was fishing literally 100 yards away from Tommy Biffle and Jason Christie, and those guys both finished in the Top 10. I also lost a 4-pounder on Day 2 of that event that would’ve given me 10 to 15 AOY points. Then we go to BASSfest on Lake Texoma – I caught them there, but I made a bad decision my last day to not go to an area that I know I should’ve gone. That’s the way it is most seasons — you have moments that help decide a season. I’ve been doing this for almost 20 years, and I can count maybe four or five “glory years” where almost everything went right. SIMMS: So now you have almost six months before the Classic. How do you prepare for that? What’s your off-season schedule to get ready for Lake Conroe? MONROE: I prepare by saltwater fishing five days a week. I completely “X” out bass fishing. I usually saltwater fish a lot in the off-season, but this year I’m taking it to the next level and fishing in the salt five days a week. My preparation is to not pick up a bass rod or get in a bass boat for months. The closest I’ll come to bass fishing is throwing swimbaits for lingcod. SIMMS: You live pretty close to San Francisco Bay, San Pablo Bay, etc., is that where you’ll fish? And what will you fish for? MONROE: A little bit of everything: rockfish and lingcod are really good out of Monterey Bay and Bodega Bay, but I’m already booked to be in San Diego for a week in October for tuna, mahi-mahi, yellowtail, that sort of stuff. I have a 34-foot Bluefin that’s towable, so I’ll pull it down to San Diego, drop the fifth wheel (RV) and fish out of one of the local landings down there. I have my eye on a couple of three-day trips there. I may do some trips to the Farallon Islands when I get back to Northern California, but I plan to spend a lot of time down in San Diego this year. SIMMS: Do you have a favorite saltwater fishery? If you had to pick just one of those to fish, which would it be? MONROE: The live-bait fishing down in Southern California is pretty awesome to me, because I don’t live there and I don’t get to do it much. Yellowtail or tuna on sardines is pretty hard to beat. But, I do have to say, there’s nothing like putting on a 16-inch mackerel and having a 25-pound lingcod eat it. It hits bottom, the rod goes “TUNK” and loads up, and you’re like “Oooookay, here we go.” It’s all good to me, though. No phone, no access, no nothing. To me, that is recuperation. 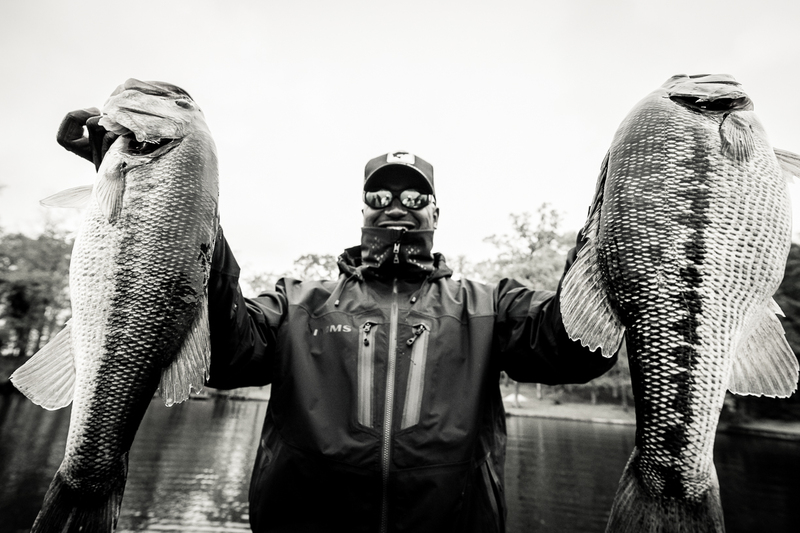 Topic(s) Bass Fishing, Bassmaster Classic, Ish Monroe by John Frazier. Bookmark the permalink.